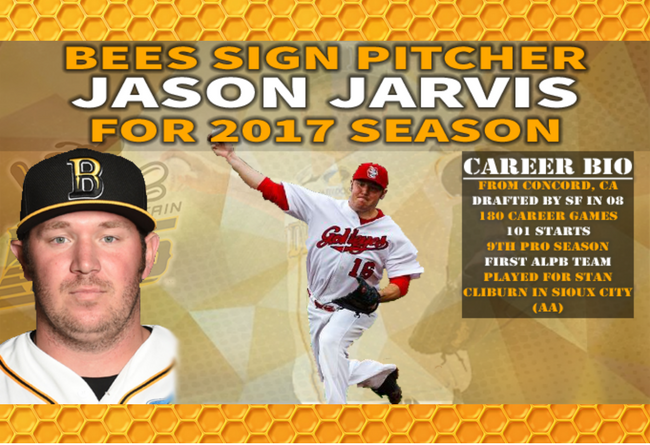 (New Britain, Conn., Feb. 13, 2017) – New Britain Bees team officials today announced that the team has signed right-handed pitcher Jason Jarvis for the 2017 season. Jarvis is the first pitcher to sign in New Britain in 2017. Jarvis joins the Bees after splitting the 2016 season between the Brisbane Bandits (Australian Baseball League) and Draci Brno (Euro Baseball League), helping both teams win championships. The six-foot-two, 195 lbs. native of Concord, CA enters his ninth professional season, and seventh in independent baseball. Jarvis was originally drafted by the Los Angeles Angels of Anaheim in the 25th round of the 2006 MLB Amateur Draft, and signed with the San Francisco Giants after being drafted again, this time in the 23rd round of the 2008 MLB Amateur Draft. Jarvis spent parts of three seasons in the Giants system, from 2008-2010. Jarvis previously played for Bees manager Stan Cliburn while both were with the American Association’s Sioux City Explorers in 2011-2013. Overall, Jarvis has appeared in 180 career games (101 starts), and has tossed 750.2 innings during his professional career.